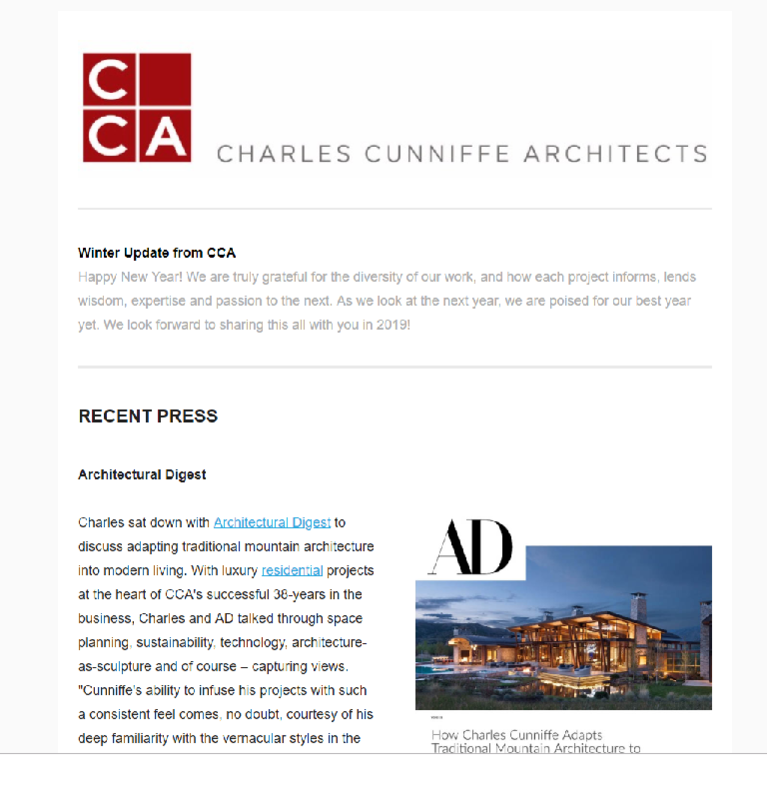 Each quarter, we send out an e-newsletter highlighting the past few months of completed work, milestones, accolades, etc. Boy was 2018 a banner year for CCA! Between our features in Architectural Digest, Luxe, Modlar, etc – to the completion of essential affordable housing, pro-bono work, public safety facilities and luxury residential projects – 2018 was beyond successful. We’re excited to share all the news with you, and don’t worry – there’s more good to come in 2019! To read our latest news, click here. This entry was posted in Featured, Industry News, On the Boards, Planning and tagged AD, ADPro, Architectural Digest, Aspen, Aspen architect, Aspen architecture firm, aspen design, aspen home design, bozeman architect, Colorado architect, Luxe Colorado, Luxe Magazine, Luxesource.com, modlar, modlar podcast, montana architect, montana home design, Snowmass, Snowmass architect, Telluride architect, telluride home design, whitefish, whitefish architect, whitefish montana. Bookmark the permalink.